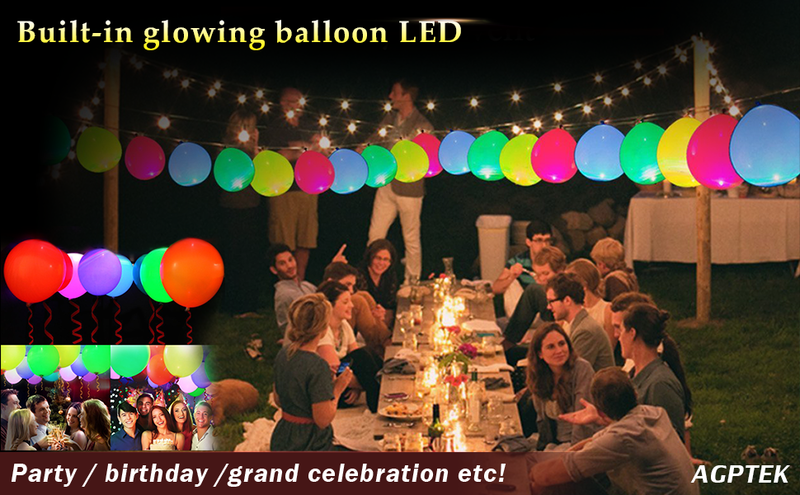 LIGHT UP YOUR PARTY: Comes with 40pcs mixed color LED balloons. These balloons are ideal for birthdays, wedding receptions, christmas, anniversary, dance club or any other special occasion that worthes celebrating. Innovative things will impress your guests, colleagues, classmates and give you a glittering party. Give you a Colorful Party! These LED balloons are something innovative to add a splash of color to your party. Glow in the dark parties, surprise your families, guests, colleagues, classmates. Ideal for party, birthdays, wedding receptions, christmas, anniversary, dance club or any other special occasion that worthes celebrating. Environment-friendly material and multiple certifications completely rule out potential safety hazard. A variety of colors: Red, Yellow, Blue, Green, White, Orange, Pink and Purple. AVAILABLE FOR NON-STOP PARTYING: Every balloon has two AG5 button batteries, which can stay lit for up to 24 hours of continued use. The balloon will reach the highest brightness after 4-6 hours of lighting. EASY TO USE: Pull off the triangle label to active the LED and blow up the ballons. They can be inflated up to 12 inches(30cm) in diameter with helium (no helium tank required) or ordinary air. Start brighting up your party. ENVIRONMENT-FRIENDLY MATERIAL: Natural latex, nitrosamine-free balloon and mercury-free batteries ensure your health.Complies with CE, RoHS, EN-71, TUV, REACH, PAHs. Never worry about the safety. BONUS RIBBON: A piece of dark blue ribbon is attached for you to decorate the balloons. Complete enough for 40pcs LED balloons.